10x45 propellers from the shop attached to the ROXXY engines with the Propellermitnehmer (propeller holder). Frame is still in evolution. Just for testing purpose and parameters setting for now. 40 cm aluminum frame with centerplates from the Mikrokopter shop. 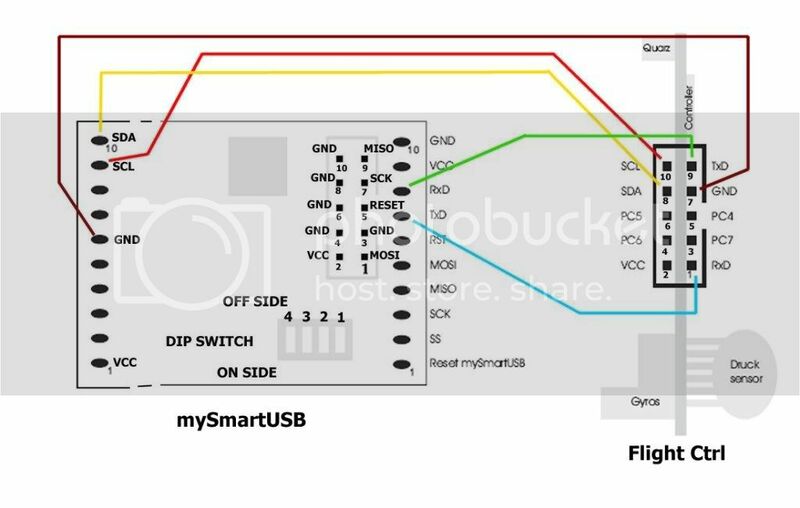 MySmartUSB interface to program the MK through USB port instead of serial (my laptop doesnt have serials ). I would never have been able to build a MK without the support by the people on the forum and on rcgroups. Special thanks to ArthurP for guiding me through the process of making the MK Tool communicate with the MSU. <MK> : The Mikrokopter of course! This is a brief note on steps to take in order to bring your MK in the air. To be synthetic I will list 'what' to do, not 'how' to do it (nor why..... ) Refer to the wiki for further info. I'm just a beginner! I'm making this list to guide myself in the building process as well. Therefore there is no pretension of completeness. Some topics may have been overlooked or misunderstood. An overall knowledge of the project is required to understand the list. I'll make a point to correct it whenever i gather more input and help from the friendly community and as i get more experienced. If you find any mistake or missing aspects please let me know. Note also that most of this list comes from other users, not me, who have taken their time to explain tasks in detail. My thanks to them! This step by step list refers to pre-assembled components ('vorbestuck' in German) bought from the MK shop. They are also checked and loaded with the bootloader and firmware. I also chose to use the MySmartUSB device rather than solder together the SerCon. For the simple reason that on many PCs and Laptops you dont have a serial port nowadays. (other users may decide different parts). Frame: you choose! E.g. 10x10mm aluminum square tube and central plate from the mikrokopter shop. Simple and lightweight. But there are also beautiful machined frames as well. I went for the standard frame they sell in the shop. Simple, lightweight and effective. There's time later to produce a better frame suited for the camera I'm going to use. NOTE: the previous list was written before the complete sets were in the shop. You can also chose one of them, They are different for size, engines and propeller dimensions. - No one wants a burnt circuit. Before connecting / disconnecting to FC or BLC (or any other component) ALWAYS disconnect power first. - It is possible to be 'shut out' of the processor in case of problems during firmware flashing. Make sure to read all the documentation that describes AVR flashing of the tool you are going to use. - The MK platform uses 3 or 4 cells Lipo batteries (i assume 3 cells for this guide). Make sure you know well about dangers involved in the use of these batteries and choose for the MK only those that can continuosly provide enough power. Lipo batteries are pretty safe if used responsibly. - from MSU to FC (10 pin serial port): used to set parameters with MKT, check sensors, test engines, etc. (three connections are actually all is needed to communicate with the FC: GND, TX and RX. Others aren't necessary, I will change the pic soon). - You should also solder the two 10 pin connectors on the MSU. The preassembled card comes with most parts SMD soldered on. The front of the board is the angle where a small arrow is. - solder 1mm² wires for power on FC J1 (+) and J2 (-), (later on you can solder on them DEANS male connector). More about wiring later. "When soldering the switch you will notice that the separation between the two sets of pins on the switch is larger than the thickness of the board. What I did was to solder one side down and flush with the board, then stick some wire through the holes in the board up to the switch pins on the other side and solder those to the board and switch"
- solder the ISP 6 pin connector (SV1 pad). from the wiki: "The ATMEL controller will be programmed via an ISP interface. This interface can be also be used for a fast communication (synchronous serial) with other controllers." Note: we are going to use platines (more later) to power the BLCs out of the FC. In this case Amperé through the switch will be much lower, one could decide to use a smaller switch. from the wiki: "Here we connect a PC for testing and calibration. The signal is TTL and not V24. For this reason we need to connect an interface converter if we want to communicate with the standard serial interface of the PC. Later on this interface can also be used for the communication (asynchronous) with other controllers." Make sure the port is soldered on correctly as later it will partially be covered by the buzzer. - solder wires to receiver on bottom side (you can cut in two and use a servo cable both for this and the camera servo). Use the female plug part. Be sure to keep 5V, GND and signal on correct wire. It's wise to keep to the standard color scheme: red = 5V, black / brown = GND, white / orange = signal. Check receiver datasheet for power, ground and signal pins. - solder the two capacitors (C7 & C10) on upper side. Respect polarity! - solder buzzer on lower side (SP1). Respect polarity! Positive is towards the board border. Note: if you are going to install the new MK3 magnetometer on your MK then you should move the buzzer out of the board, far from the MK3 and connect it with wires. It would affect the magnetic field otherwise. - solder the pressure sensor on the FC. Respect polarity! (see pic, silvery side is towards inner board, black side towards angle). High components like the pressure sensor and the 5V regulator may be bent to allow a better placement of the FC. Pressure sensor needs to be covered to work properly. More about that later. - Dommy suggests also to apply a heat sink on the 5V regulator of the FC. It gets really hot when using a servo for the camera. Now we check if our soldering work was good. For testing is strongly advised to use a current limited power supply. Supply current needed for FC and 4 BLC is about 200mA. I used a small NiMh 350mAh battery (an original one from X-Ufo ), just added the right connectors with duct tape... crude. You can refer at the wiki page about the FlightCtrl to see were the mentioned pads are. - 5,0V Test of the digital supply. Check at TP1 to GND. Voltage should be between 4,9 and 5,1 V.
The outputs of the gyro amp (Pins 8, 7 and 1 of IC2) should show a voltage of about 1,2-1,8V (ideal value would be 1,5V) in idle state (board/copter not moving). The factory adjusted output signal of the gyros may vary slightly, we must therefore sometimes correct the signal. To communicate with the FlightCtrl using the MKT we are going to use the MSU with the cables previously done. Here are some threads in the forum that you may find useful. As you can see ArthurP was really helpful to me to make things run. Thank you! - install the MSU drivers on the CD (i read newer ones have compatibility issues, older ones seem to work just fine). - set dip switches on the MSU: 1, 3, and 4 to OFF, 2 to ON (ON=dip switch towards side of PCB). - connect the MSU to PC. - go to the USB devices. You should have there a CP210x USB Composite Device. - configure a COM port to it: go to the COM ports section, select the CP210x device, right click, Properties. Go to port settings. Assigned a COM port (1-4). Thus you will have a virtual COM port on the USB device. Set bit per second setting at 38400. - disconnect the USB cable. - connect battery to FC, keep it OFF for now. 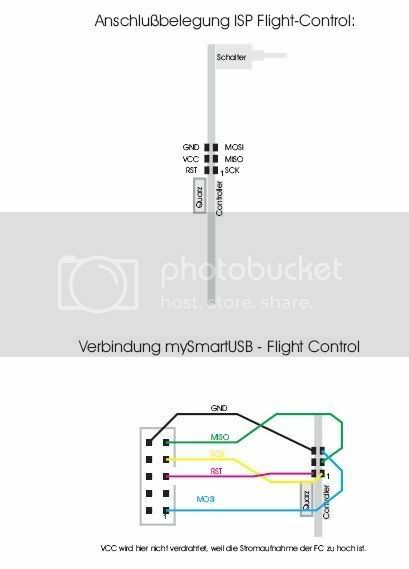 - "Connect the 10 pin connector to the FC and the USB cable to your PC. The red strand should be on the side of the connector which has a 1 next to pin 1 on the FC. - Start the MKTool. You may need to go to "Controller flashen und terminal" and choose the correct COM port, then go back to the MKT (choose Debug). - If you turn on your FC now, then the red and green lights should come on, but instead of the incessant noise you should now within several seconds have a nice and quiet FC but see the numbers in the Analog box in the MKT screen start changing. And if you press the Start button in the Scope box, your graph should become alive. Moving the FC will affect the graph accordingly. - If you indeed have a live FC with good serial connections over the 10 pin serial interface cable, then you're in business. You can now start setting up your FC properly. E.g. go to Settings in the Mikrokopter Parameters box and set the correct check boxes for the configuration you have (e.g. Luftdrucksensor ON, Kompass OFF)." In the wiki MikroKopterTool page you can find how to set parameters. Anyway the preassembled board comes with correct parameters already set. They worked for me. I guess they will be fine as a starting point for any one in similar weight class. "After changing parameters you have to Write them to the FC. The FC should respond with one or more beeps (number of beeps = parameter set). You can also save the configuration to a file which is handy for setting up multiple FCs or going back to a previous configuration." If you are having problems one possible cause is bad soldering of the 10 pin port. Check it again with a tester. Otherwise go back and "double check the software interface, Windows being the most likely culprit. I.e. go to the Windows Configuration/Control Panel screen, and then under System -> Device Manager, check the Ports. You should see CP210x USB to UART Bridge Controler (COMn), device is working properly, Port settings 38400 bits per second, 8 data bits, no parity, 1 stop bit, no flow control. I have driver Silocon Laboratories driver date 22-02-2007, driver version 4.40.1.0. If the device is not working properly or the com port does not correspond to what you think you assigned, that's most likely where your problem is". - Once done close the MKT, turn off the FC THEN disconnect the USB cable. - Plug receiver with crystal in. Turn on FC and, using the MKT, check if radio signal is received. Start SCOPE, you should see curves change accordingly to how you move the sticks on radio. - Altitude control: in MKT click on Settings, Configuration. You must set the 'Altitude control' checkbox. Also check switch for setpoint to have altitude hold. On your radio you can set a switch to a certain channel. On MKT you can assign a POTI to activate / deactivate altitude control. Set POTI relative to the channel you are using (Channels section). Through the MKT you can see when the switch is activated. This will prevent you from getting higher than the altitude you are at when the switch is turned on... but you can fly lower of course. - You can even connect a servo to be used to tilt a camera. Automatically it will move compensating the Nick movement of the FC. Usually channel 8 is left for camera tilt control. You can configure it the same way you did for the altitude sensor. CONGRATULATIONS! Your MK is alive! This element is simply a way to bring power to the BLCs without passing through the FC. This is advisable especially for high power setups but i decided to do it this way even for the ROXXY relatively "mild" power. This way when battery is connected the BLCs are immediately powered. The FC isn't until you switch it on. Note: wire section depends mostly on the engines you are going to use. In this case they are oversized, true. But I plan to switch to more powerful engines somewhere in the future. - you can use the contacts from a DEANS male connector (just pull them off with pliers), this gives you really good power conducibility. One platine is for positive, one for negative. - for each platine solder one 2mm² wire from platine to DEANS male connector (assuming battery has DEANS female connectors, others are possible obviously), 1mm² from platine to BLC respecting polarity on the board. NOTE: when soldering wires on DEANS connectors is best to keep them plugged with another connector. This way when they are heated by soldering the contacts wont move in the plastic and stay aligned. - once done you can cover with heat shrink. - solder one capacitor on each BLC (make sure the solder is strong mechanically too, otherwise there's the risk of them coming off in flight). The longest 'foot' of the capacitor is +. On the BLC the + pad is clearly marked. - solder the 1mm² power wires from the platine. - solder the 0.25mm² signal wires from the FC C and D pads to C (J6) and D (J7) pads on BLC. - you can solder a 10 pin male connector on the ISP port of the BLC. Otherwise you can make a cable for the MSU with a port like those used on IDE cables. You will need to use the ISP port to update the firmware of the BLC. You don't really need to flash anything right now since the pre-assembled version comes with the latest firmware already loaded on. - it was suggested by Dommy to put some heat sinks on the MOSFETs, especially if you are going to use more powerful engines than the ROXXYs. - you can then wrap them in heatshrink to protect them better. Leaving heatsinks out and making small holes where the two leds are. - is also a good idea to label each BLC (1, 2, 3, 4). - solder the power wires to the FC on the DEANS connector (where you soldered the wire from the platine too). The screws in the set that comes with the engines are quite long. In fact if using 10x10 mm square aluminum tube they can reach the inside of the engine, potentially damaging it when put on work. You can see this by feeling friction while rotating the engine with your hand and comparing it to an unmounted engine. So You should put some spacers between engine and frame and / or frame and screw head. - solder the wires from regulators to engines: front and rear engines are clockwise while left and right are counter-clockwise. For clockwise rotation (with ROXXYs): red => A, blue => B, black => C.
For counter-clockwise rotation: red => C, blue => B, black => A. Length of wires should be made accordingly with the frame. - mount propellers using bolts and the propeller holders ('PropellerMitNehmer') (prop savers have been reported causing vibrations). Remember: front (1) and rear (2) are clockwise; right (3) and left (4) are conterclockwise. - fix propellers with sealer so they don't come untighten due to rotation and vibrations. - mount the electronics on the frame, starting from the FC (Abstandshalter M13x5 have proved really effective). Respect the position of the engines according to the BLC number. - it's advised to keep BLC close to engines although many fly also with all of them around the FC (better protection but possible overheat and maybe possible cause of interference?). - make sure there are no shortcircuits caused by frame. - tight wires to the frame so they can't get tangled by propellers. Duct tape is good enough for now. Better to test everything before actually fix everything neatly. - cover the air pressure sensor with electrical tape and punch a small hole with a pin otherwise you can use microphone covering material. This is necessary otherwise the sensor may be fooled by wind turbolence caused by the propellers and even sunlight. - make sure the propellers are tight. - lock somehow the MK to the ground or workbench. Make sure anything stays clear out of the way of the propellers (your fingers included :D). - connect battery. BLC will beep and make the propellers turn a bit. Both green and red leds will stay on. - connect FC to PC (see above). - turn FC on. Red led on the BLCs will turn off. - read, using the MKT (scope), the MK parameters. - if needed change flight mode from sporty to beginner (throttle stick top left, nick/roll stick top. FC should beep 3 times). - in MKT open the motor test section. Here are shown 4 sliders, one for each engine. Check engine test checkbox (FC beeps). Move anyone of the sliders and check that the relative propeller turns the correct way. Note: response may be slow if port speed is set to low or the PC is an old model. - check for vibrations and if sensors have 'noise' in their signal. - don't keep the engines running for too long. - now you can test it with the transmitter while holding the MK in your hand. - turn FC on, start engines (throttle stick bottom and right). - increase power and tilt the FC to check if engines react accordingly (you should feel the MK trying to move and to level itself back when you release the stick). Now here comes the moment of Truth! :D.
- protect the FC using some tough but light dome. - turn on the FC, turn on the engines (left stick bottom right). Then slowly increase the throttle. Slowly! Even with the mild ROXXYs your MK can become a dot in the sky in seconds if you exaggerate. Don't stay too low in hovering though (below 1 meter) as it may cause turbolence. then you can try to fine-tune the parameters to have a better flight with your MK. how do I find the correct parameters values for your setup? The new NaviCtrl with GPS positioning control is about to come out (July 2008? ), in combination with the MK3 magnetometer will be a terrific enhancement for the MK. Bluetooth Module (with adapter) is already in the shop. This is also a neat add-on. Through the program DUBwise by LiGi you can check and set your MK through your handy. Much better than having to bring a laptop on the field (where dust, dew, mud, bugs abund....) Thanks Ligi! Well, it wasn't as brief as i thought, was it? If you notice mistakes or important steps left out let me know.